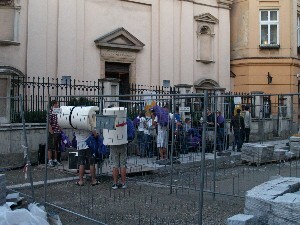 After our visit to Auschwitz in the morning, we visited with the sisters briefly once more to retrieve our lost wallet. 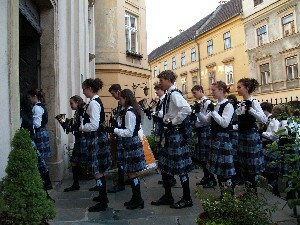 We arrived back in Krakow in time to stop in the hostel for a brief change out of wet clothing and head off to the bus to get our bells and kilts. 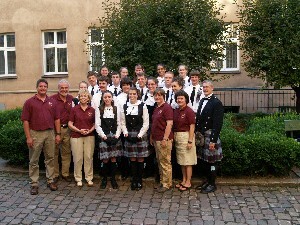 We walked to our next concert which was at the Lutheran church in the Old Town. It was a bit of a hike, but it was through narrow streets, paving stones and a construction zone. No room for a bus, but enough room for a hike. We were fed well before the concert and then had a wonderful performance. We started with a small number in the audience, but the audience grew as our music made it out into the streets and called people in to hear us. There were 82 in the sanctuary for the performance and there were several others who came to the outside doors to listen. A new ringer - Mark - our driver! Norbert Czarnek translated for my comments and the audience was full of questions and interest. 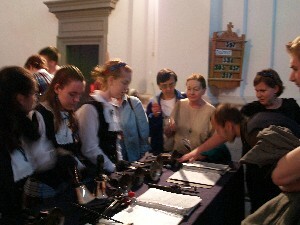 They crowded he tables afterwards to inspect the bells and ask questions of the ringers, get autographs from our resident composer, and to test out the ringing of bells and handchimes. 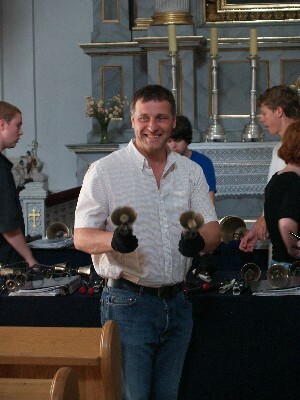 After selling a number of CDs, we were on our way to pack up the bells and head out for some dessert. A great day for all! 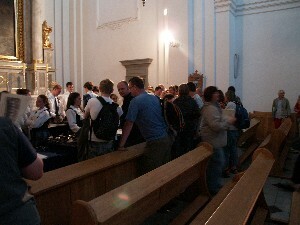 Some of the audience after the concert. 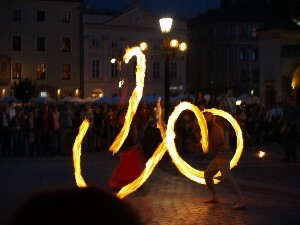 Entertainment in the town square.